We have reduced the registration cost this year. you can purchase one or both for $15 each. 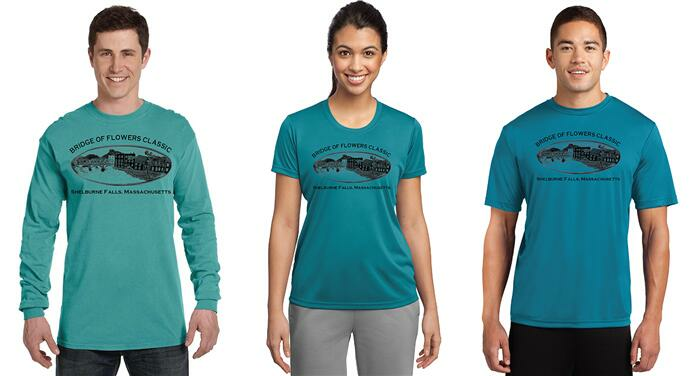 Online shirt orders accepted with registration through 8/1/2018. We appreciate your planning to participate in the Bridge of Flowers Race. Because of the costs related to refunding entry fees, as well as the significant costs for putting on an event of this magnitude, and with the knowledge that our net proceeds are going to several charities, registration fees are non-refundable. If you ordered a shirt, upon request, we will be happy to send it to the address you provided. An additional charge for postage may be requested. 1. You can state that you are happy the race supports good works, and not direct funds to any specific charity. 3. You can actively fundraise through a customized pledge page. DIAL/SELF Youth & Community Services is a community-based non-profit agency that has been serving the youth and communities of Western MA since 1977. Providing a wide array of services that foster youth empowerment and community service. Over the course of the last three decades, thousands of area youth have been served by the agency in Franklin and Hampshire Counties and the North Quabbin Region. Cancer Connection provides a haven where people with cancer, their loved ones and caregivers can learn to cope with the physical and emotional turmoil that is part of a cancer diagnosis and to explore ways to enhance their strength, their hope and their care through support groups, integrative therapies, creative activities and education. All services are offered free of charge. The Art Garden serves the rural hilltowns of western Massachusetts by providing low-cost, sliding scale, and free arts programming for the community. The Art Garden's studio, located in Shelburne Falls, is a nurturing, non-judgmental, and inspirational environment where people of all ages and experience engage in the creative process, and explore and exchange ideas through individual and collaborative art-making. The Art Garden programs include: after school, school vacation, and summer programs for children and youth; drop-in open studio for all ages; community exhibitions; engaged public art; and support for emerging and established artists. Friends of Children is a nonprofit organization dedicated to impacting the lives of hundreds of children each year by working to bring security and hope to abused and neglected children in the foster care system. The mission of Friends of Children is to serve the needs of children through individual case advocacy and support of coordinated programs and policies to improve their lives. Our vision is that all children, especially those who are most vulnerable, have the opportunity to reach their fullest potential. We believe all children have the right to safe, consistent and nurturing homes in which to live, as well as access to essential services and quality educational opportunities that will allow them to succeed. The Northwest Massachusetts Incident Management Team (NWMIMT) is a volunteer public safety management team. Our mission is to provide resources in manpower, equipment, and management expertise to assist a community in the mitigation of emergency situations. Most of our members are career or volunteer firefighters, but an increasing number are coming to us from the private sector. Within western Massachusetts, southern Vermont, and southern New Hampshire, we respond when a disaster or other emergency incident exceeds the local community’s ability to effectively manage the response. When assisting these communities, our services are free of charge, provided under mutual aid agreements.